Here comes another CCC Multiple Choice Question Paper with Answers (SET-M) in the on going series of CCC Study Material. You can use all the published CCC Question Papers as Sample Paper / Practice Paper SETS or Model Test Papers, in addition these CCC exam question answers can be useful for many other competitive exams too. 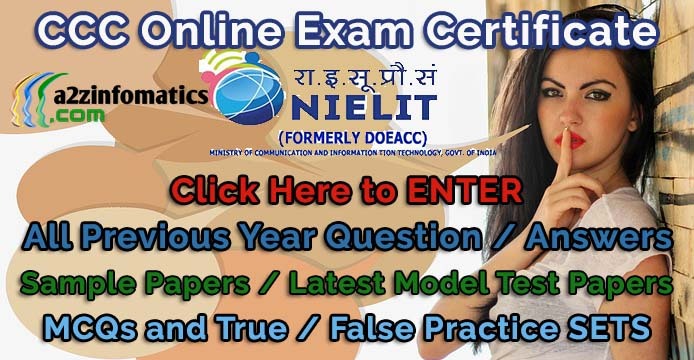 Prior to make any attempt for the DOEACC / NIELIT CCC Examination, don’t forget to have a look to the latest 2018 CCC Exam Syllabus. Best of luck for your CCC Online Certificate Examination, feel free to check all published CCC practice paper SETS for the better chances to crack the CCC Exam at the first attempt. 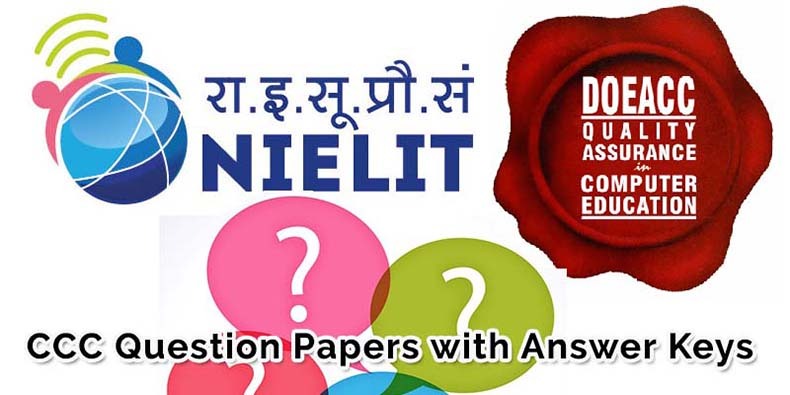 DOEACC / NIELIT CCC Online Exam Question Paper SET-M with Answers – Solved CCC MCQ Sample / Model Test Paper SET-M.
CCC Exam MCQ Sample Paper / Question Answer Model Paper SET-M. Note: This CCC Exam Online Question Paper (SET-M) consist of total 50 question with the answers at page no 4 of this post. CCC Previous Year Solved Question / Sample / Model Test Paper SET-M.
Ques 1- Which of the following LINUX file system does not support journaling feature ? Ques 2- Which module gives control of the CPU to the process selected by the short-term scheduler ? (a) it has a dialog box. (b) it has a submenu. (c) it cannot be used now. (d) it has a new application. Ques 5- In a dialog box which button allow you to select or unselect an item from a list of items ? Ques 6- Which of the following is not available on the Ruler of MS Word screen ? Ques 7- In Work, the default alignment for paragraphs is ………………………. (a) left aligned, or flush margins at the left edge and uneven edges at the right edge. (b) centered, or equidistant from both the left edge and the right edge. (c) right aligned, or flush margins at the right edge and uneven edges at the left edge. (d) justified, or flush margins at both the left and right edges. (a) triple click the chart object. (b) click and drag the chart object. (c) double click the chart object. (d) click the chart object. (a) click the application minimize button. (b) click the document close button. (c) double click the applications control menu icon. (d) double click the document control menu icon. (a) Moves the cursor to the beginning of the document. (b) Moves the cursor to the beginning of line. (c) Moves the cursor to the beginning of paragraph. (a) Moves the cursor to the end of line. (b) Moves the cursor to the end of document. (c) Moves the cursor to the end of paragraph. Ques 13- Which of the following are Word processing software ? Ques 14- Which file starts MS Word ? Ques 16- How should you print a selected area of a worksheet, if you’ll want to print a different area next time ? (a) On the file menu, point to print area and then click set print area. (b) On the file menu, click print and then click selection under print what. (c) On the view menu, click custom views, and then click add. Ques 17- Your German supplier still invoices for parts in deutsche marks. How can you have Excel convert these sums to Euros ? (a) On the insert menu, click symbol and from the currency symbols subset, select the Euro sign. (b) On the tools menu, click Add-Ins, and select the Euro currency tools check box. (c) Apply a selected background color. Ques 18- Thrashing ………………………. the CPU utilization. (a) a set of pages that are actively used together. (b) a space in memory. (c) an area near a set of processes. (a) it defines a new locality. (b) it is in the same locality from where it was called. (c) it does not define a new locality. (d) (b) and (c) both. You are now on the Page No 1 of this CCC Exam Online Practice Question Paper SET-M with Answers. Complete Answer Keys for CCC Previous Year Solved Question Paper Set-M on Page no 4 of this Post.